Thank you for your interest in Bike/Walk Central Florida. For residents of Orange County who are interested in living with less traffic, lower pollution, a stimulated economy, and better health, BWCF is your go-to organization. BWCF is a movement of residents who encourage biking and walking and who advocate for the resources to make these activities safer. BWCF is always searching for passionate volunteers to be a part of our team, and we have plenty of ways for you to get involved. Volunteering for BWCF allows you to give back to your community and create positive change. Safer roads, healthier neighborhoods and more options for transportation are just some of the benefits BWCF is helping to bring to Central Floridians. With the outdoor Central Florida lifestyles, BWCF is always seeking help to represent cyclists and pedestrians in local neighborhood events. We would love to have you represent BWCF at a local event such as a community health fair or National Night Out, an annual family-friendly event that promotes police-community partnerships with music and games. Since June 2012, BWCF and its community partners have reached over 36,000 people at events and presentations, allowing us to build relationships and get feedback from the people who know our streets the best. This is a great opportunity to engage with the community and connect with others who are passionate about biking, walking and creating safer streets. Best Foot Forward (BFF) is a coalition formed under BWCF to research and report how neighborhood crosswalks are performing if cars and pedestrians are using safety behaviors required by law. BFF hires people to perform data collection on monitored crosswalks. This is a paid position where you will be required to cross the street at specific intersections and monitor how many people yield to you. These numbers are turned into yield rates and help BFF track and report to cities and counties how many people at the region’s most dangerous intersections are following the law and yielding. Since we began, BFF has affected physical improvements and seen safety rates improve: 12 percent to 45 percent yielding in marked crosswalks on roads 35 mph or less and from 1.2 percent to 23 percent in marked crosswalks on roads 40 mph or higher. Data collectors are crucial in monitoring this progress. No experience required, and training is provided. New opportunities to promote biking and walking in partnership with other organizations in Central Florida are always welcome. We do our best to be available to come to your school, community group or organization with a free informative presentation that can be tailored to your ideal timeframe – 15 to 30 minutes – with time for discussion. These presentations are available to anyone living or working in select Florida counties. If you need assistance, please contact Barbara via email ([email protected]) or phone (407-636-5606). BWCF has a Volunteer Advisory Board and is always interested in new member candidates. The board meets quarterly, and volunteers on the board assist in writing newsletter stories, representing BWCF at special events and more. Please contact Amanda Day ( [email protected] ) for more information about the board. If you want to save over $850 a year in gas, become healthier, reduce stress and support the regional biking and walking lifestyle, below are some great ways to enact change in your day-to-day life. Free yourself – ditch the car and let your feet or bike take you where you need to go. You can use SunRail to head to Park Avenue or Church Street for happy hour after work. Try walking with the kids to the local park and use the opportunity to teach them about safe biking and walking habits. Grab your bike and test out the Lynx and SunRail instead of dealing with traffic on the way to work. Who knows – you may just change your commute for good. Learn all about pedestrian and bicycling laws and safety from a variety of organizations on our resources page. Once you become a bike and ped expert, share your knowledge with others – at work, in classes and even at the dinner table. Get the conversation started! Make your voice heard and let local officials and lawmakers know that biking and walking are important to you. Your support urges officials to consider all modes of transportation when creating roads – not just cars. Find your local official’s contact information, here. Want updates straight to your inbox? Sign up for the Bike/Walk Central Florida Newsletter here. Educate walkers, cyclists, motorists and transit riders about Florida’s road laws, their rights, responsibilities and courteous behaviors. Support transportation corridor planning and design using Complete Street principles. Encourage the development and maintenance of trails throughout Florida. Promote a built environment that supports physical, environmental and economic health, provides for safe transportation choices, and encourages interaction among citizens of all ages, income levels and abilities. 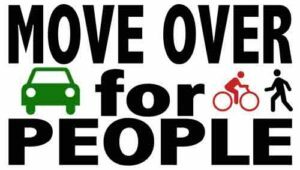 Expand the current Move Over law to include vulnerable road users. Create Vulnerable Road User legislation that is enforceable regardless of leaving the scene of the crash. Make texting while driving a primary offense for all drivers. Clean up statutory language with regards to definitions of sidewalks, crosswalks, lane position of bicyclists and other related matters. You can see all of their advocacy updates, here.